Xolo mobile has officially introduced two new smartphones the A600 and the Q900. The Q900 comes with nice specifications at very reasonable price. The device comes with 4.7inch display having 1280 x 720 pixels resolution at 312 ppi with 16.7M colors. The company would soon launch its first 4G enabled smartphone in India by the first week of November. 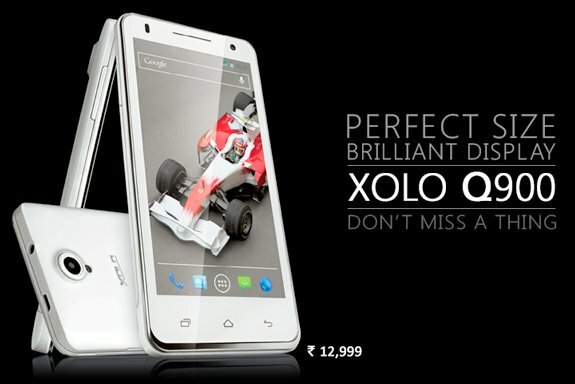 The Xolo Q-900 on Android v4.2 Jelly bean OS and is powered by 1.2GHz quad core processor. It has 1GB of RAM, 4G of internal storage and further expandability up to 32GB via micro SD card slot. It is Dual SIM handset with 3G support and houses 1800mAh battery, which offers 13 hours of talk time, up to 384 standby time . For the better graphics rendering there is PowerVR SGX 544 GPU cloaked at 286 MHz. Talking about the dimensions, it is 9.9mm thick and 137mm wide. The Xolo Q900 packs with 8MP AF rear camera with BSI sensor, LED flash and 2MP front facing camera with video calling support. The handset can record Full HD 1080p videos at 30fps. There are Accelerometer, Ambient light sensor, Magnetometer and Proximity sensor. The phone features 3G (HSPA+ 42.2 Mbps DL, 11.5Mbps UL), WiFi, Bluetooth v4.0, micro USB 2.0, FM radio and GPS connectivity. The Q 900 is Priced at RS 12,999.